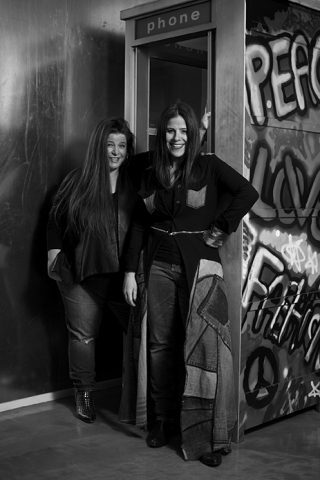 Founded by Toronto-based sister duo Naomi & Devorah Shapiro, ROCK ‘N KARMA is a favourite among Canadian fashionistas. With a lifelong passion for fashion and all things music and art, ROCK ‘N KARMA believes in people, positive energy, and providing a unique experience; because after all, you can’t buy karma. With the vision of providing women of all shapes and sizes essential wardrobe basics and seasonal statement pieces, ROCK ‘N KARMA opened a flagship location on Queen St. West where fashion begins on the street. The space immerses guests in the ROCK ‘N KARMA experience from the moment they arrive and guarantees a personalized shopping experience unlike any other. ROCK ‘N KARMA’s street-to-chic collection incorporates traces of rock & roll that stem from all things art with a balance of bold and daring that doesn’t compromise comfort, style or taste. The line captures creative silhouettes using an addictive signature miracle fabric and features hand-painted print and beading embellishment making each piece unique. ROCK ‘N KARMA is more than a label; it is a way of life for women who don’t fit into any specific mould. A ROCK ‘N KARMA woman has a mind of her own, is comfortable in her skin and is confident in her style.